The first branch will open outside of Chicago in Cicero, Illinois, in mid-February. 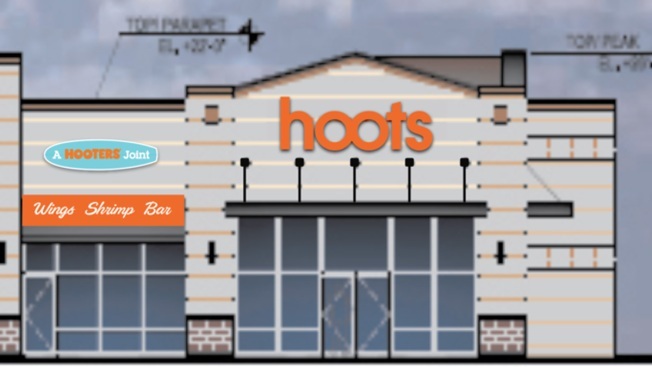 A rough rendering of the Cicero, IL, Hoots location. During the first few weeks of January, “New Year, New Me” became a popular mantra. Hooters seems to have taken the words to heart and made good on its New Year’s resolution. The restaurant chain, known for its scantily clad female employees, has decided to launch a new fast-casual franchise that will still have wings, but fewer breasts. In an attempt to attract millennial and female diners, the company announced Tuesday that it will open Hoots, where servers will no longer wear the famous skintight Hooters tank-tops and booty-exposing orange shorts. Instead, they’ll have a uniform that includes a “newly designed Hoots shirt” and either shorts or pants, Hoots spokesperson Liz Harmon told the Huffington Post. The eatery will consider employees of both genders, a radical shift from Hooters’ all-female waiting staff. The first Hoots will open outside of Chicago in Cicero, Illinois, in mid-February. “We selected Chicago as our launch market largely due to the success of our carry-out business in the Chicagoland area,”said Neil Kiefer, Hooters Management Corporation president and CEO. The first branch will cover about 2,800 square feet, support 30 employees, and have a 75-person capacity. Equipped with a full bar, its menu will serve up Hooters’ greatest hits. But are traditional Hooters’ patrons there for the taste or the view? Given the popularity of other “breastaurants” like Twin Peaks, demand for venues like Hooters is clearly still high. Though fast-casual dining is also a growing market, especially among young adults, it remains to be seen whether people will go to Hoots just for the food.